Our weekend was a busy one. After I met friends Saturday morning for shopping at the Farmers’ Market, followed by lunch, Motor Man and I headed to the Outer Banks. Along the way, we stopped to visit Aggie, who was looking especially beautiful. I think she’d had her hair done. The next morning, we were on the beach in time to catch the sunrise over the ocean. We then drove up to Corolla and out on the beach. 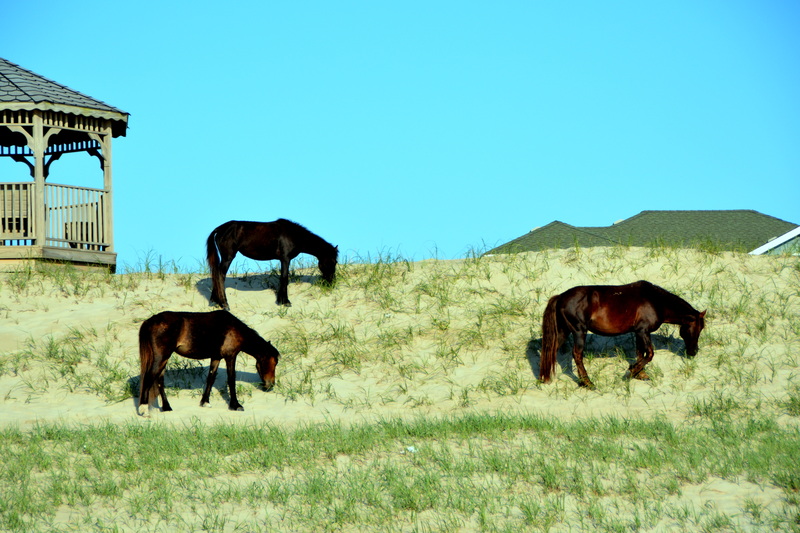 We only saw three horses; they were grazing on one of the dunes in the early morning sun. 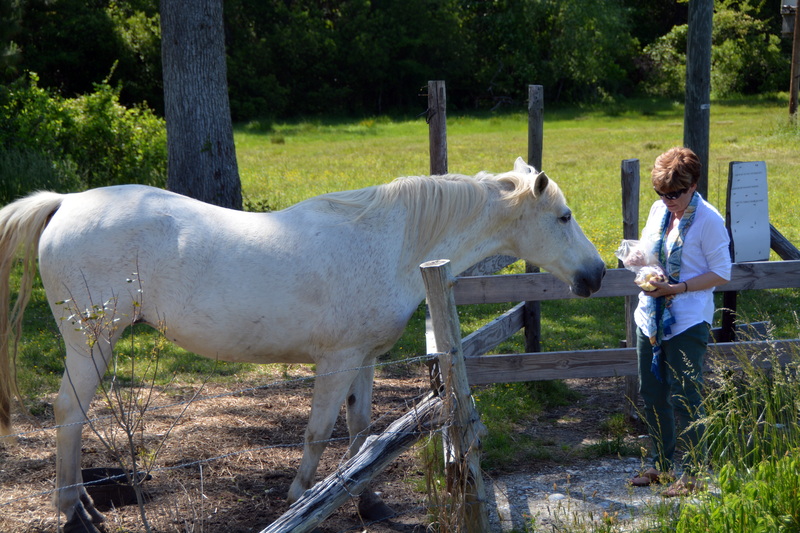 On our way home yesterday, Aggie was treated to another apple as we passed by her pasture. The weather was picture perfect in our area for all the outdoor holiday activities….including horse sightings. This entry was posted in Family, OBX Wild Horses, Sunrises/Sunsets, Traveling Days and tagged Aggie the Currituck Horse, Farmers Market, OBX, outer banks, wild horses of corolla. Bookmark the permalink. 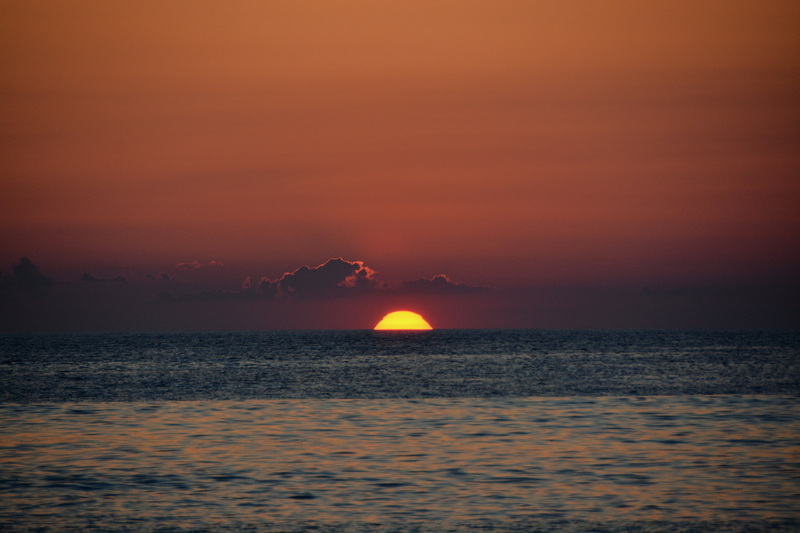 What a beautiful spectacle, the sunrise. Sometimes I just stare and forget to take a picture. Aggie definitely knows when to get ‘spruced up’! Her favorite human ‘aunt’ with a treat is reason enough. She definitely enjoys your visits. Pics are beautiful – a nice, relaxing weekend following a busy start. Thanks for taking us along for the ride. What a great weekend. Thanks for sharing. Aggie is so sweet.. ♥ Glad you had a great weekend! 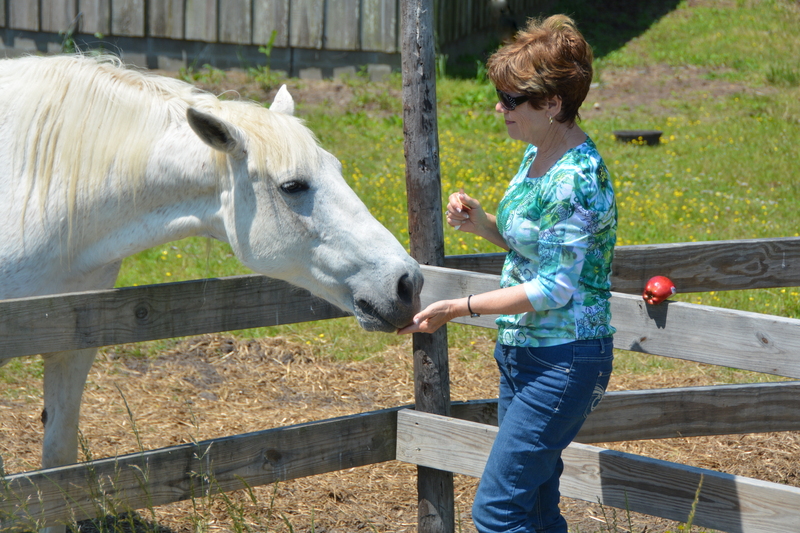 I have yet to get to Corolla to see the horses! Meant to this last time at the beach but somehow never did it. Maybe next time. And I am going to be on the lookout for Aggie, too. I know she’s always glad when you stop to see her. i do love sweet aggie! Looks like Aggie is getting her fair share of treats! It was a great weekend, weather-wise. I’m glad you got to see Aggie both times. The dunes are grass-covered down there, most I’ve seen aren’t. Nice morning shots of the sunrise and horses. We had picture perfect weather for the weekend too. How nice you got to see your ‘friend’ Aggie again! Aggie’s looking nice … I know she was loving the weather (& attention! )… Great sunrise, too ! It was a lovely holiday weekend. Glad Aggie is doing so well and you and JR had a good holiday. Love the horses as always. The picture of the horses grazing on the dune is so lovely it looks like a pastel painting. Thanks for sharing!